The Xpress CM100 reads card data from a variety of contactless sources, including credit cards, key fobs, and NFC-enabled cell phones. It is designed for POS applications that accept contactless transactions, such as quick-service venues and self-service kiosks. Four LED indicators at the top of the module make it easy for cardholders to see that they have completed a succesful card read operation. The Xpress CM100 is designed to allow flexibility of integration of EMV 2.0.1 contactless card reading to different market segments. With its modular architecture, the reader can be mounted to kiosks, attached to terminals, or used as a countertop standalone device. It is also possible to integrate the module with other payment technologies, such as MagStripe readers. 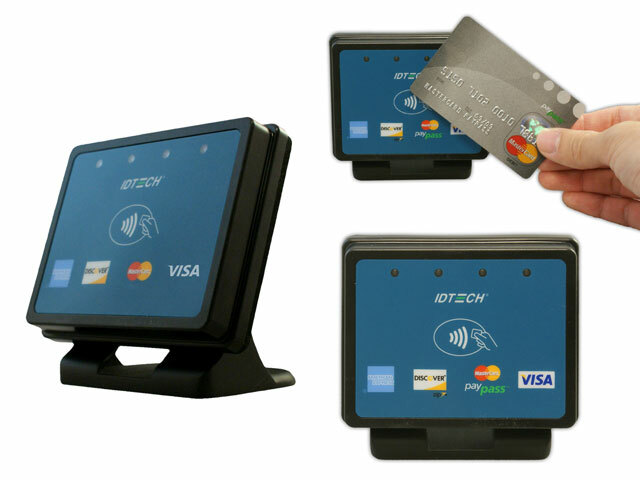 The Xpress CM100 is an optional attachment for the ID TECH Sign&Pay terminal. The Xpress CM100 is perfect for a wide variety of applications, including quick service restaurants, ticket booths, parking garages, retail locations, public transportation, and gas stations. With support for Visa payWave, MasterCard PayPass, American Express ExpressPay, Discover Zip and MiFare and NFC technologies, the Xpress CM100 can be integrated into just about any application that accepts contactless technology.